Beautiful photos with accurate colors, terrific video capture, and a strong autofocusing system are what makes Sony’s NEX-5T a great little camera. Given the uproar over the new Sony full-frame cameras that have rocked the digital imaging world, it’s good to remember the company makes other models that are quite competent – and don’t cost over two grand. 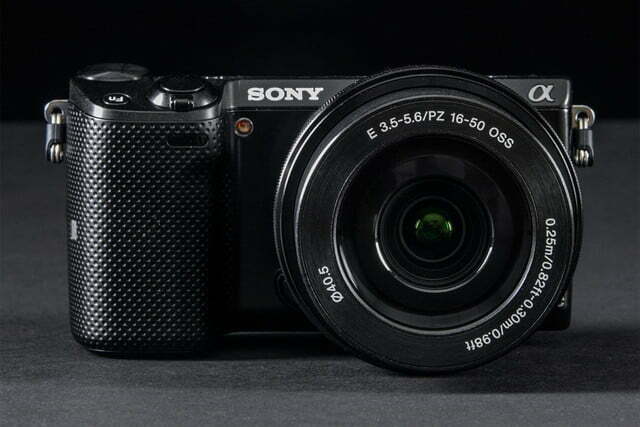 Enter the new relatively affordable 16-megapixel Sony Alpha NEX-5T compact system camera (CSC), an interchangeable lens model that takes excellent still photos and videos (an area Sony excels in). Throw in a DSLR-size sensor, snappy autofocus, and Wi-Fi, and you have a package that will satisfy any casual user stepping up from a basic shooter. Too bad the detachable flash spoils some of the fun. 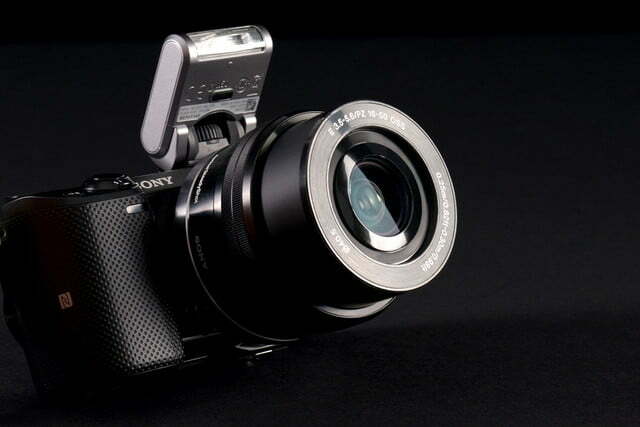 Sony’s NEX mirrorless cameras have been around since 2010 and their overall design hasn’t changed much. In a very compact body you get a DSLR-size APS-C sensor and an interchangeable lens mount, so picture quality and creative options are miles ahead of any compact digicam. 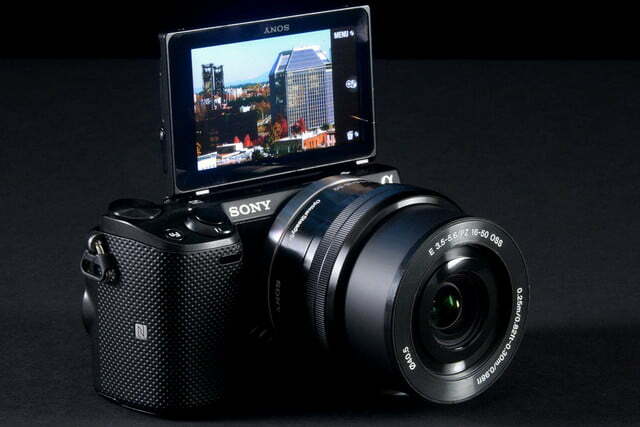 Due to the small size there’s no room for a built-in flash, viewfinder, or lots of buttons and dials. In other words you’ll use onscreen menus often, and as for that add-on flash, it’s one of the biggest camera design flaws we’ve encountered in a while. One of the selling points for the NEX-5T ($700 with 16-50mm kit lens, $550 body only) is the 180-degree tiltable LCD screen. Sony says you can easily take selfies with this system. They’re right but only if you don’t attach the included external flash since it prevents the display from moving into the full upright position. Now, we don’t want to come off as being nitpicky over nothing, but we like having a flash available at all times to use as fill lighting for subjects in deep shadows or if the ambient light is just too dark. Sony supplies a small case you can attach to the strap to retrieve the flash as needed but, sheesh, this was a big swing and a miss. 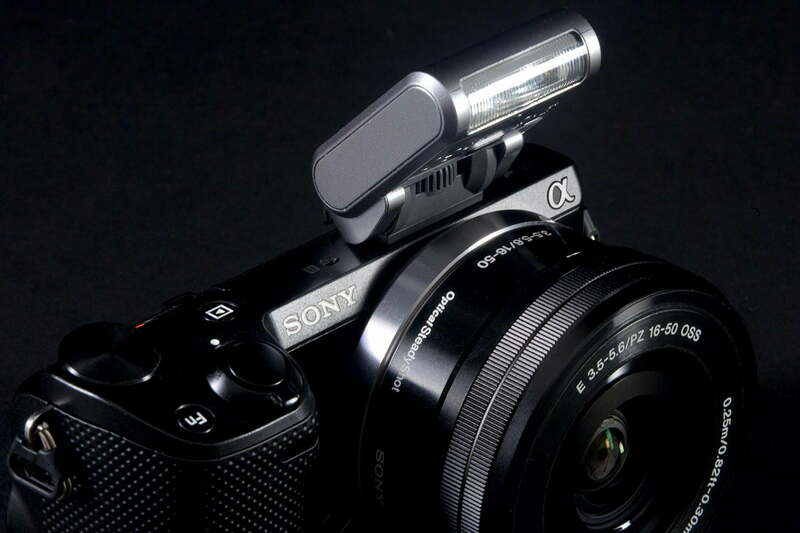 It’s just too inconvenient – especially since it’s a screw-on flash rather than a simple slide-in as you find with Olympus PENs. However, if you’re not a big self-portrait fan or you hate using a flash altogether, this is a non-issue. Even with the flash in place you can still adjust the display for overhead and low-level shooting. If you can deal with this issue or couldn’t care less, read on since this is otherwise a pretty cool camera. The NEX-5T is available in black or white versions and measures 4.4 x 2.3 x 1.5 inches, tipping the scales at around 15 ounces with kit lens and battery. 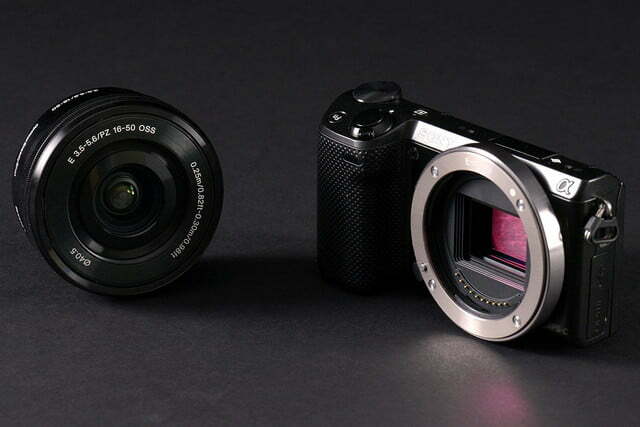 The camera is available in a body-only setup or bundled with a kit lens. 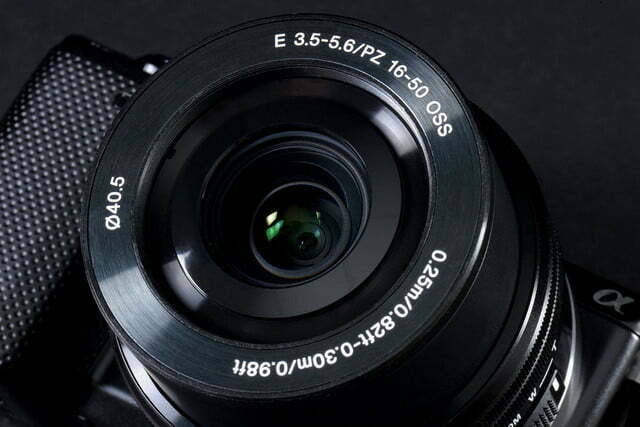 Our review sample had the basic kit glass which is a powered 16-50mm f/3.5-5.6 optically stabilized zoom lens (24-75mm 35mm equivalent). 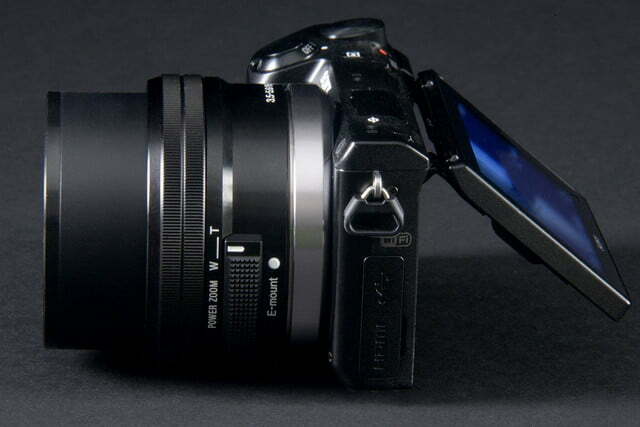 The key feature on the front is, of course, the E-mount for the many lenses available for the series. Also on the front is an AF Assist lamp. The grip is a decent size with a textured surface (as always you should do your own hands-on before you buy this or any camera). The top deck has two pinhole stereo mics, an accessory terminal for the supplied flash or optional electronic viewfinder (EVF), Playback and Function buttons, as well as a combo on/off-shutter switch. The default Function is focus mode but you can choose among AF, AF setting, white balance, metering or Picture Effects; we chose WB. There’s also a control dial for ratcheting through the menu system. Since there’s no classic mode dial you’ll use the onscreen menu system to change shooting options. It has everything you’d expect in a CSC or DSLR other than Custom settings (although you can assign functions to the two soft keys on the back). Speaking of the back, it’s dominated by that tilting 3-inch touch-panel LCD screen (rated 921.6K dots). It’s a solid display although a bit reflective so we had to adjust it to the Sunny Weather setting to handle the Arizona sunshine of our test location. Other than the aforementioned “selfie” issue, the screen has a good range for shooting overhead or at waist level. 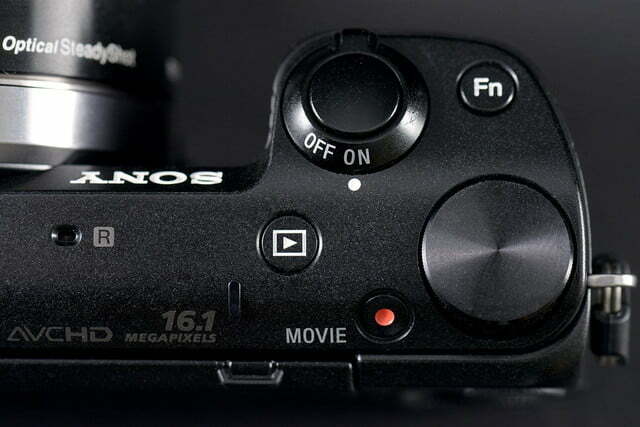 You’ll also find a red-dot movie button, two soft keys that change according to the mode the camera is in, and a jog wheel surrounding the OK button. 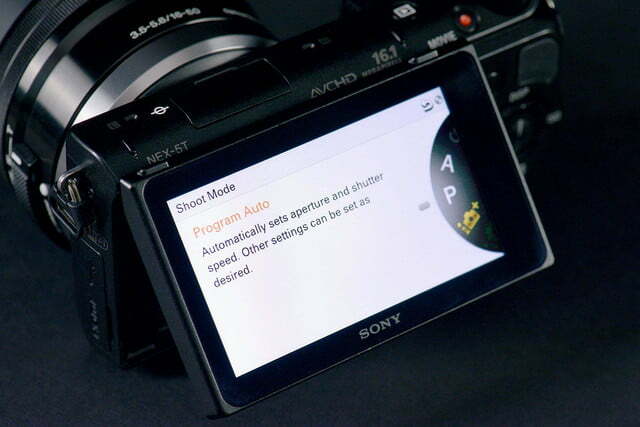 Tap the four points on the wheel and you access Display, ISO, exposure compensation, and burst mode/self-timer. 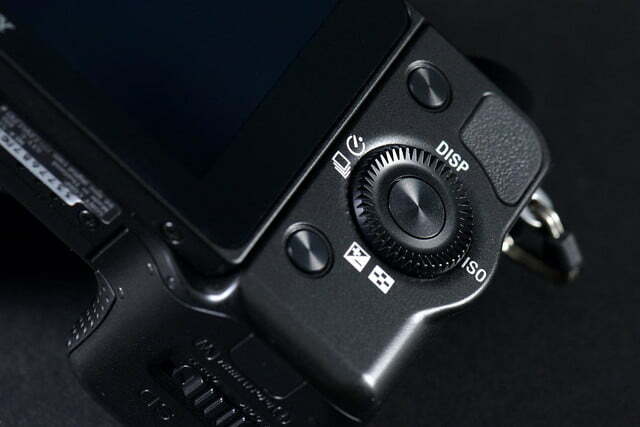 The right side of the NEX-5T has an NFC logo; it’s here you can tap and link your Near Field Communication-enabled Android phone. On the left you’ll find a compartment for mini HDMI and USB connections. The bottom has the battery and card compartment. 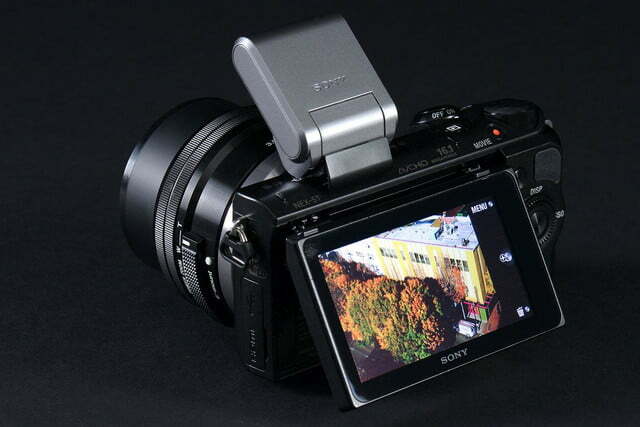 The camera accepts SD and Memory Stick media. All in all, the 5T is an evolution of the NEX design – which wasn’t bad to begin with, minus the flash issue. If you purchase the 5T kit that we reviewed, you’ll get the body and 16-50mm lens, battery rated a solid 330 shots, AC adapter/charger, USB cable, strap, flash, and flash case. The supplied CD has Image Data Converter ver. 4.2 and PlayMemories Home ver. 1.3 (both Windows only) for developing RAW files and handling/editing your images, plus the full manual as a PDF. A 104-page printed instructional manual is also supplied. We’ve handled NEX cameras since Day One so there was nothing unusual about prepping it for our tests; if you’ve used NEX cameras before then you’ll be up and running in no time. The lack of buttons and dials are still a bit disconcerting as you’re constantly using the onscreen menu to change many settings. It’s far from difficult, however, it just takes a little time getting used to – especially coming from a series of very linear menus on many of our recent review samples. In other words, you’ll need that 104-page instruction manual nearby as you initially delve into the camera. Once you do, almost everything makes sense for everyday shooting. Photos we took showed the depth, richness, and color accuracy – all were right on the money. While small like a compact point-and-shoot, the NEX-5T is definitely a CSC with all the modes expected including Intelligent (smart) Auto, Superior Auto, Scene (9 options), PASM, and Sweep Panorama (Sony’s very cool setting for grabbing a nice panorama without spending hours stitching one together in post processing). We worked our way through the modes during several trips to various scenic spots (see samples). For this review the camera was set to maximum still and movie resolution, 16.1 megapixels and AVCHD Progressive (1080/60p). 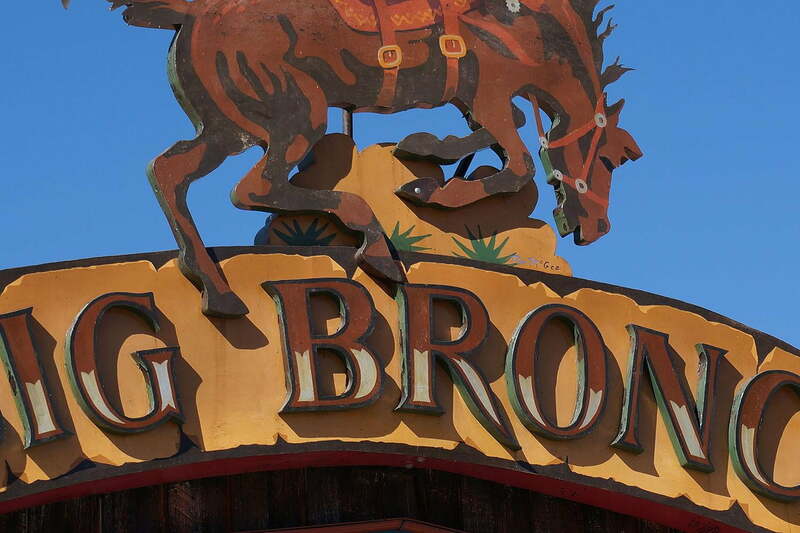 Then it was time to put the camera through its paces in various Arizona locales. As we noted earlier, there are definitely some reflective issues with the screen but the Sunny Weather setting handled most but not all of them. Before diving in let’s point out one of the 5T’s best features: Hybrid AF. With this system, Sony uses a combination of Phase Detect and Contrast Detect focusing so you’ll rarely run into any issues zeroing in on a subject in practically any lighting. Many better CSCs have this and it was one of the reasons we liked the Fujifilm X100S so much. Beyond this, the camera has DSLR-like specs including shutter speeds of 30-1/4000th of a second and ISO ranging from 100-25,600 (100-3,200 is the native range). We wish camera manufacturers wouldn’t bother with five-figure ISOs since the quality is really bad unless you spend five grand on a full-frame pro DSLR. This is true for Sony and everyone else. 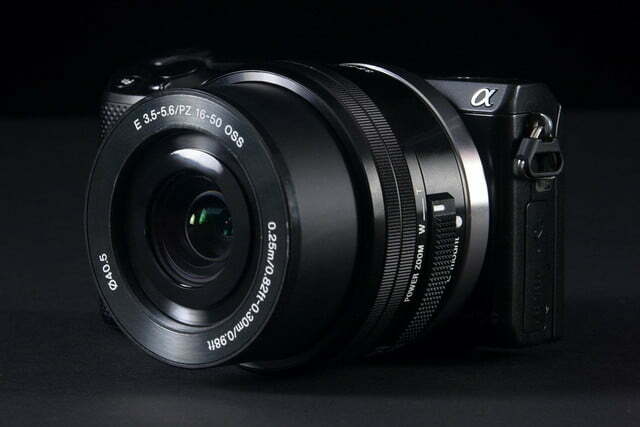 In the case of the NEX-5T, ISOs hold up well until 3,200, declining severely at higher settings. Now you know why having a flash at the ready at all times comes in handy! Even given our preference, if you’re posting to the Web you can probably get away with ISO 6,400 and using all available light. Our tests also showed the optical image stabilization system built into the lens is quite good, helping to achieve sharp focus at slower shutter speeds. Another positive is the overall quality of the stills. 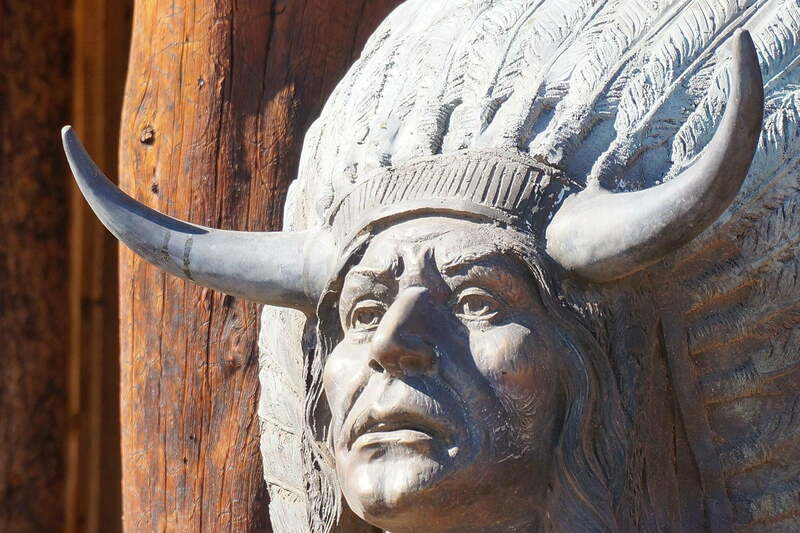 We know it isn’t difficult for any decent camera to grab good shots in bright Arizona sunshine but the photos we took showed the depth, richness, and color accuracy. 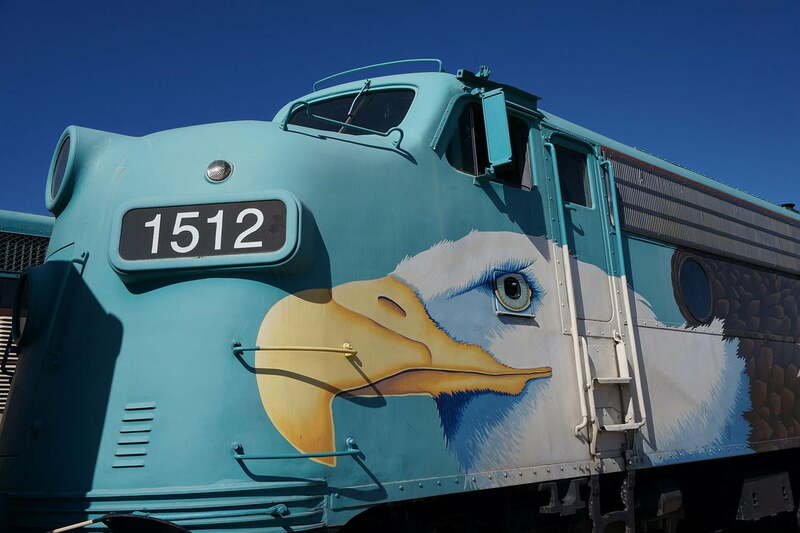 The colors of a blue train and red peppers all were right on the money. 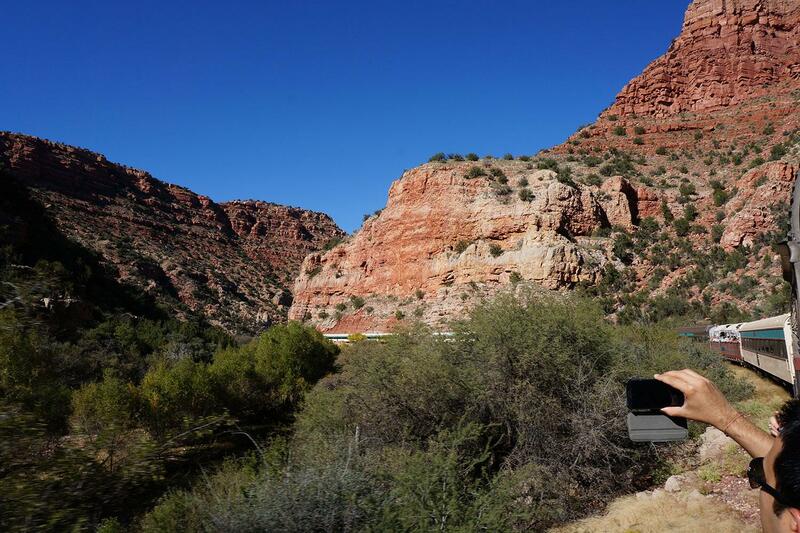 We especially liked the Sweep Panoramas of the mountain-scapes but there were some issues since we were on a moving train and there were a few skips – stand on solid ground and keep your arm level, however, and you can’t beat this feature. One of the 5T’s best features is Hybrid AF, which lets you zero in on a subject in practically any lighting. As for the videos, we’ve always been fans of the AVCHD Progressive format and once again the camera delivers the goods. Colors were spot-on with little evidence of rolling shutter and moiré – if movies are important to you, this feature is a big plus. As is standard operating procedure in 2013, the NEX-5T has built-in Wi-Fi. The PlayMemories Mobile app makes for easy connections with your smartphone once you enter the generated password that pops up on the 5T’s screen into your phone. From there you send shots to Facebook and other places. The app lets you remotely control your camera as well. It works and is seamless, which is all that really matters. Overall you’ll be quite happy with this kit. 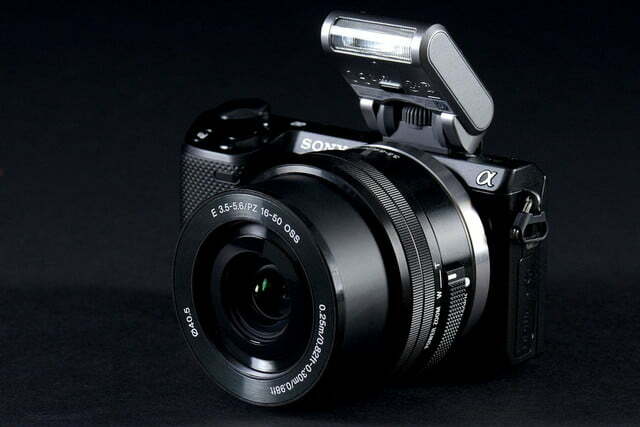 It’s easy recommending the Sony NEX-5T. It grabs images that are this close to Fujifilm CSCs using the X-Trans CMOS sensor. 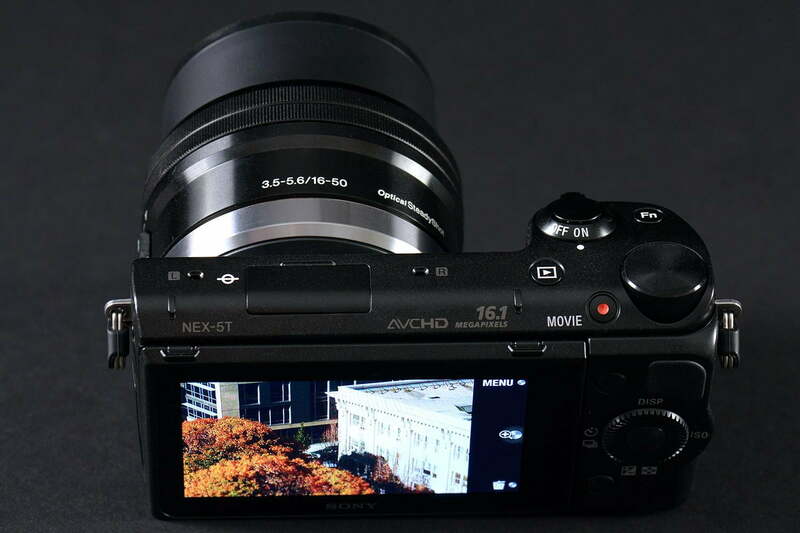 Since Sony supplies chips for practically everyone, they could even be the same imaging device but we slightly prefer the photos of the X-M1, which are just a bit sharper thanks to the Fujifilm glass. 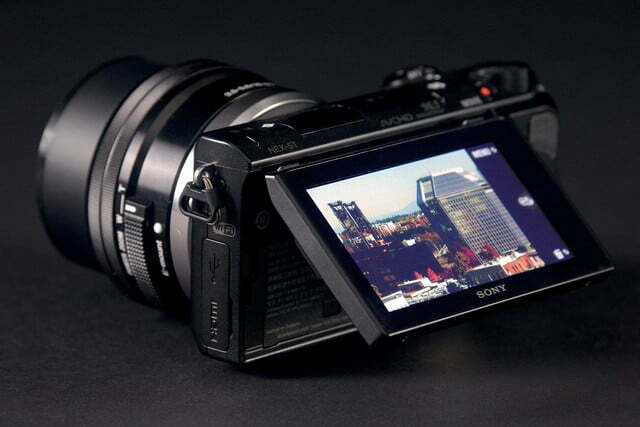 Where Sony beats Fujifilm – and practically everyone else – is its 60p videos that seem to jump off the screen. We also really liked the 5T’s Hybrid AF which never hesitated for a moment focusing on subjects. Again, the only major issue we had is with the lack of a built-in flash, and the restriction put on the tilting display when you screw on the external flash. 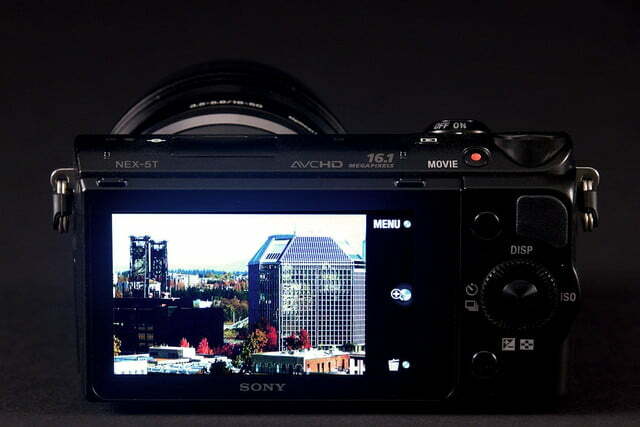 If this isn’t an issue – and for many of you it won’t be – the NEX-5T is definitely a good package for the price.